When you are in a hand against another player and you make it too the river, it is best to turn over your hand if you have called the bet so you can be sure you are beat. Just the other night a beginning player went to muck her cards because she thought the other person had a higher pair when SHE had a flush! She did not notice it. Had she just thrown in her hand she would not have known because cards speak. 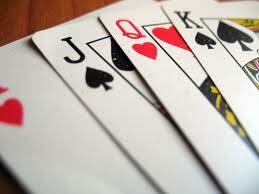 Even if you do not see a winning hand , others will if the cards are turned up.